1. Paint/ Varnish compatibilty- a test should be carried out using proposed paints to ensure they do not have adverse reaction – a sample piece of the floor and varnish can be provided to the prospective lining company to allow adequate testing. 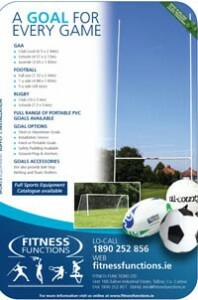 We are often asked how how it costs to line mark ONE sports court for a school or sports club. 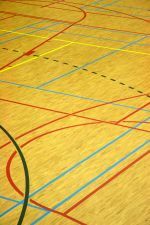 The answer and reality is that, it’s much better value for the school or sports club to get a number of sports courts marked at the same time, within reason and according to the sports they play. The main reason being the cost of labour. Used predominantly in schools to allow separate sporting activities simultaneously. A divider curtain is part of the DoES PE594 sports equipment list. See specification below. 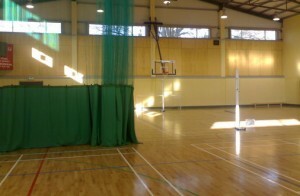 A physical, as well as visual barrier, curtains can be installed at most locations in a sports hall photos. A guide price would start from €1,750 (ex Vat). Trackway: To comply with BS 1892-2.11: 1989. Extruded aluminium section. Length determined by size of hall. Complete with levelling hangers, trolleys, net clips and fixings. Trackway to be rigidly fixed in such a way that no vertical or horizontal movement is possible. Note: Normally the net is suspended underneath a central main roof structural steel member which is accessible and not obstructed by light fittings and radiant panels. Roof drawings should be made available to PE Supplier to confirm that this is so. If you require additional sports court line marking information please do not hesitate to contact us. 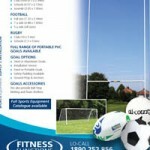 Email our digital marketing manager; niall@fitnessfunctions.ie. We look forward to your email.